This week's teaser comes from Paradise Lost: Evensong by LJ Smith. Have you guys heard of this yet? After LJ was essentially fired from writing the Vampire Diaries series she turned to Kindle Worlds and began finishing the story she started so many years ago in the form of fanfiction. LJ describes it better and includes links to her two latest installments HERE in case you're interested. I know a lot of people prefer the TV show to the books, but I love me some Damon and Bonnie and that can only be found in the LJ books, so I might have spazzed a little when i found out she was continuing their story. For anyone who's a fan of the books, and Bamon in particular, I suggest you look into these! 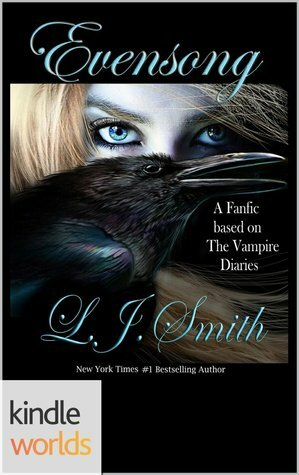 This fanfic is based on The Vampire Diaries book series—also by L. J. Smith—and takes place after the volume Midnight. Damon is back and enjoying his vampire existence to its fullest. Elena, Bonnie and their friends are in their third week at Dalcrest College, ordinary students aware of an extraordinary world that verges on their own campus. Stefan is scarcely aware that he is living in a fragile paradise with Elena as his devoted girl . . . until one night it all shatters. He wakes from a dream to find Elena limp and white in his arms and rushes her to the hospital for a massive transfusion. Elena survives, but Stefan decides that the only way she will ever truly be safe is without him. To make his exit complete, Stefan removes himself from the memories of Elena, her friends, and all of Fell’s Church. Can first love ever really be forgotten? Will Damon finally have Elena by his side as his Princess of Darkness? The epic story begins in Evensong: Paradise Lost. For more about Paradise Lost: Evensong check out these sites! Finally someone else who loves Bamon! Now I love Damon and Elena together in the TV show because it's so different. But the books? I ship Damon and Bonnie so hard. It's been awhile since I've read the books makes me want to reread them. I loved these books and was so disappointed about what happen. I refuse to read the books not written by L.J Smith. Hopefully I will get to read these sometime! That last quote has me spazzing!! I'm really curious how she intends to end everything for these characters. Thanks for sharing! I've missed new stuff from L.J Smith. It's been a while! Yay! Another Bamon lover! I haven't read the books not by LJ either. I really looked into them to see what was going on with them but I didn't like the direction they were taking them. I think I prefer Damon with Elena in the show too, but I haven't watched in awhile so I'm not sure. But they were really cute together last time I watched. Wait, the author got fired from writing her own books? Is it because of the TV show? Sorry for the questions, I'm just so curious. That doesn't seem like something that should be allowed to happen! The publisher owned the series not her, so they we're allowed to fire her and bring in another author even though she'd written all of the books. It's a scary thing that something like that can happen. It's a reminder to make sure you know the details of all of the contracts you read before signing them! I adore Bonnie and Damon in the books and on TV. Julie Plec has done a great disservice to the fans of this ship by shoving Delena down our throats and to appease the rabid Ian and Nina fangirls. I hate her with a fiery passion for destroying the palpable chemistry that is Bamon and I will take L.J. Smith's writing over hers any day.